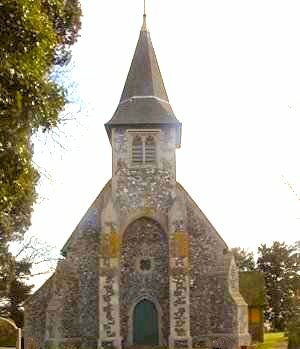 St Peter's Church is situated in the village of Oare, approximately a mile and a half from Faversham. 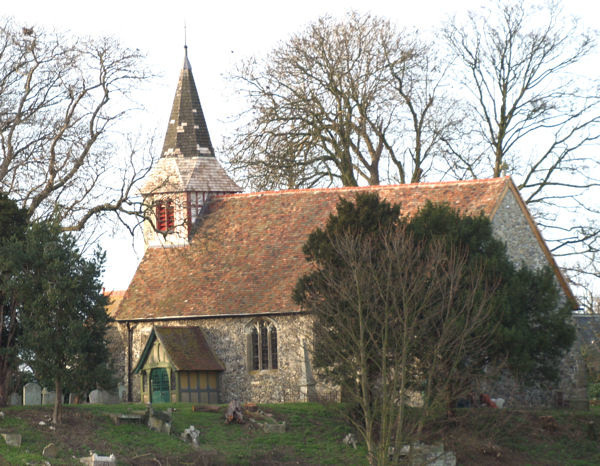 The church dates back to the 12th and 13th centuries and continues to serve the people of Oare and the rural communities of Uplees, Luddenham and Stone. St Peter's is a church for everyone. We try to make it so. Its services are simple and its sermons meaningful. It has stood through wars and conflicts as a symbol of peace and brotherhood, and will continue to stand thanks to restoration work started in April 2003. Visitors are welcome and details of access are posted on the noticeboard at the church. 5th Sunday of every month - 10:30am - Service at one of the Kingsdown and Creekside Cluster of churches. Oare is part of this cluster together with Teynham, Lynsted, Doddington, Newnham, Norton and Wychling. St Peter's Oare, a Grade I listed building, is often described as a 'mainly 13th century church' - which it is. However, the view that confronts the visitor entering the churchyard gate is pure Victoriana, the work of diocesan architect Joseph Clarke, an example of the sympathetic restoration of which not all Victorians were capable. Indeed, it is this west elevation, with its louvred bell-tower and cedar-shingled spirelet, that is St Peter's to visitors, artists and photographers. The building could hardly be better sited. It stands where village becomes countryside, set inconspicuously back from a road that leads only to the broadening waters of the Swale and their marshland bird-life. In the churchyard, a few mature trees remain of those that once cast gloom over church and graves. They rise from among ancient headstones and ivy-clad tombs, providing summer shade for those who want to enjoy the panoramic views over Oare Creek and acre upon distant acre of marsh pastures with the North Downs as a backdrop. With binoculars or good eyesight you can rest on one of the conveniently located benches and count how many far-off churches you can pick out from this elevated point of vantage. But how old is the church? you ask. Everyone seems to. To this there is no categorical answer. Today the building is little changed since the 1860s restoration and yet there was a church here when the Domesday Book was penned - well, half a church, but which half our Norman forebears didn't say. A church half-finished? Or a church part-razed by the tempests of that tempestuous age? What we do know is that the chancel was extended eastwards in the late 14th or early 15th century, and some time thereafter the old east window was taken out and replaced by a larger one in the Perpendicular style. The actual glass is more recent - the work of F.C. Eden. It was given in memory of artist Francis Forster, a casualty of WWI. Another window by this noted London artisan, on the north wall, commemorates another war victim. Below it a memorial slab set into the frame of this once tall lancet window names those who died in the great explosion of 1916, when the marshes throbbed with a wartime industry of munitions manufacture. 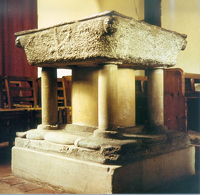 Back in the secluded peace of this village church is one treasured rarity, a square font of Purbeck marble from the late Norman/Early English period. Its sides were once elaborately carved, but many years ago it went missing, only to be recovered decades later from a nearby pond, somewhat the worse for its immersion. Was it concealed from Cromwell's ravaging iconoclasts? No one knows. This hazy fact must take its place with the many mysteries hidden among the pages of time. But is it not these undocumented secrets that make a church like St Peter's so alluring? Who can tell when the truth will emerge and another page of history can be written?